Following on from yesterday’s hurried post, here’s what the Football Manager 2018 data has to say about the line-ups for Morocco v Iran today. The explanation for this is in the link above, but in a nutshell I’ve treated the Football Manager database like a scouting tool and scored the two teams by combining their in-game attributes. Here’s how the two teams stack up in terms of overall ability, according to Football Manager’s researchers. Morocco look to have the edge here overall, with their right side looking strongest, while Iran’s defence in particular looks a bit light – their best chance of a goal may come from Jahanbakhsh on the right. 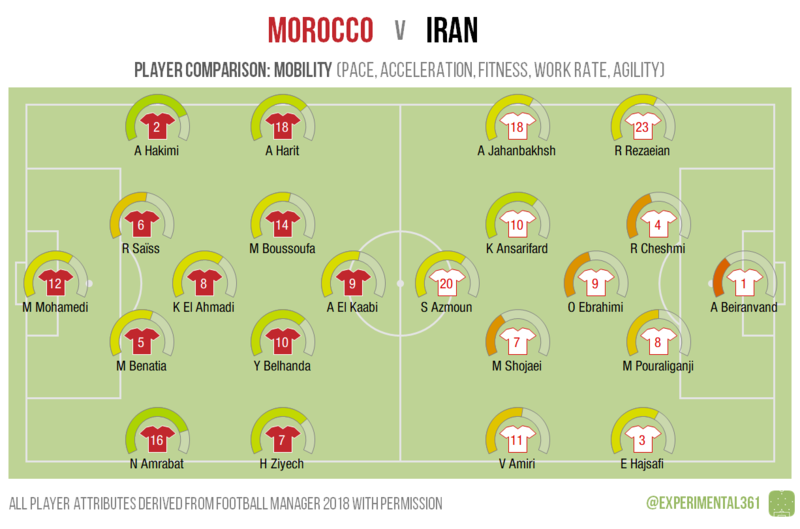 Morocco again look better equipped with their mobile full backs likely to give them an advantage if they can get them forward. Morocco look second best going forward, with the 5’6″ Boussoufa not likely to be much use in particular, however their centre backs should surely be watched at set pieces. 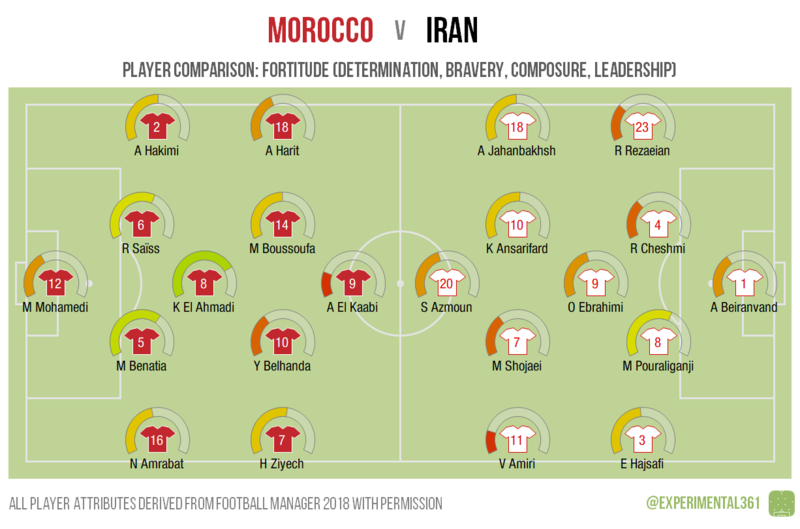 El Ahmadi and the centre backs behind him could be key to marshalling the Morocco team, and may be able to drive them forward, while a few players seem as though the occasion might get to them – Amiri and El Kaabi in particular. 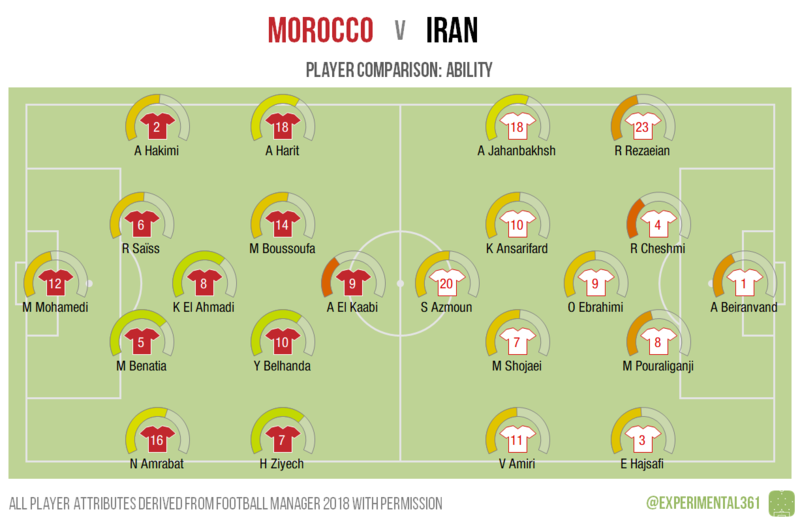 The Moroccan midfield looks pretty well-stocked in creative terms, with all of the players behind the striker looking capable of carving out opportunities. For Iran it looks like a lot may go through Shojaei in central midfield.